Federal workers wait for food distribution to begin on Saturday at a pop-up food bank in Rockville, Md. The Capital Area Food Bank is distributing free food to government employees during the government shutdown. 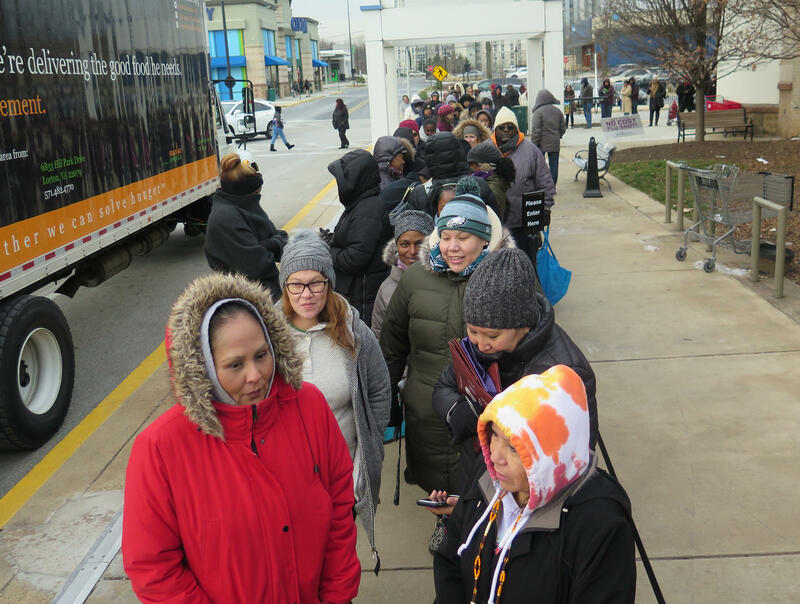 Early Saturday morning, nearly 200 people stood in the freezing cold outside a Maryland supermarket waiting to collect a small allotment of free food. They were federal employees, there to pick up fresh produce and canned goods from the Capital Area Food Bank, which organized five pop-up food distribution centers for government workers. As the partial federal shutdown — now the longest-ever in U.S. history — grinds on, its financial and emotional impact on federal workers and their families continues to grow. Across the country, some 800,000 federal employees have been sent home or are working without pay, as congressional Democrats spar with President Trump over his demands for a $5.7 billion border wall. At the end of this past week, many of them received a paycheck for zero dollars and zero cents. "They're just worried about where to get their food," said the food bank's president and CEO, Radha Muthiah. "We've had someone say 'I'll pay you back after I get my paycheck, but I just need [food] now.'" More than a quarter-million federal workers live in the capital region. As Muthiah checked the workers' government-issued ID's, her tally read like a cross-section of the entire U.S. government: Department of Treasury, Smithsonian Institution, General Services Administration, Food and Drug Administration, FBI, White House. As the line moved forward, the list grew longer. Capital Area Food Bank CEO Radha Muthiah tallies up federal workers and their workplaces as they pick up free food on Saturday in Rockville, Md. The food bank — whose clients are most often people living near or below the poverty line — is helping ease at least one expense for workers whose bills keep coming even as their pay has dried up. Federal employees in line said the canned food and bags of carrots and apples would help free up funds for things like utilities, rent and baby formula. But Lorette Legendre, a General Services Administration contractor, was quick to point out that food banks cannot become a permanent solution to the government's stalemate over a barrier at the U.S.-Mexico border. "People can't survive like this," Legendre said. "To stand out here in 30-degree weather to get food? This is America? Something's wrong here." Her frustration was echoed by others in line who said they felt like political "pawns." "Playing with people's lives for the sake of whatever political idea you're behind, it's not good," said Terrence Graham, who works in IT at the State Department. "They should value the worker a little more than that." Graham said he and many of his colleagues live paycheck-to-paycheck. Farther down the line, an Army veteran named Dee said she is having trouble affording both food and medical treatments for a disability. She asked NPR not to use her last name because of her position at a federal agency. "You want to serve your country," she said. "Mexico is supposed to be paying for this, but instead we have to pay for it." She added that if the shutdown continued, she might also have trouble feeding her dog. From left, Michele Howard, who works for the Indian Health Service, and Terrence Graham, who works at the State Department. Both picked up free food at a pop-up food bank in Rockville, Md. Last week, Congress approved a plan to eventually provide back pay to employees affected by the shutdown; President Trump says he's also on board. But with no clear end to the standoff in sight, some of those in line Saturday said they're considering applying for other jobs. One employee of the Office of Personnel Management said he was thinking about applying for work at McDonald's. Others said they're rethinking whether a career in the federal government is sustainable anymore. The Capital Area Food Bank says it distributed more than 30,000 pounds of fresh produce Saturday, but that the emergency efforts to help federal workers won't impact its other programs. Muthiah says many of the people her organization is helping guide people through the process of getting food assistance have never had to ask for that kind of help before. "It's hard for a lot of people," Muthiah said. "It's a matter of pride, being able to have taken care of themselves and their families and now having to depend on others." On Friday, as volunteers gathered to pack the free food, Muthiah says one woman showed up to help, but told food bank staff that she would be coming back the next day to pick up food for herself. Muthiah explained that the woman said she wanted to feel like she had "done something in order to get that free food." The food bank says it will continue to distribute food to federal employees until the government reopens. America's longest government shutdown is now in its 24th day. And it's putting a strain on federal workers, contractors and their families. In a suburb of Washington, D.C., this weekend, a nonprofit hosted five pop-up food banks for federal workers. And more than 2,000 people showed up. Here's NPR's Ian Stewart. 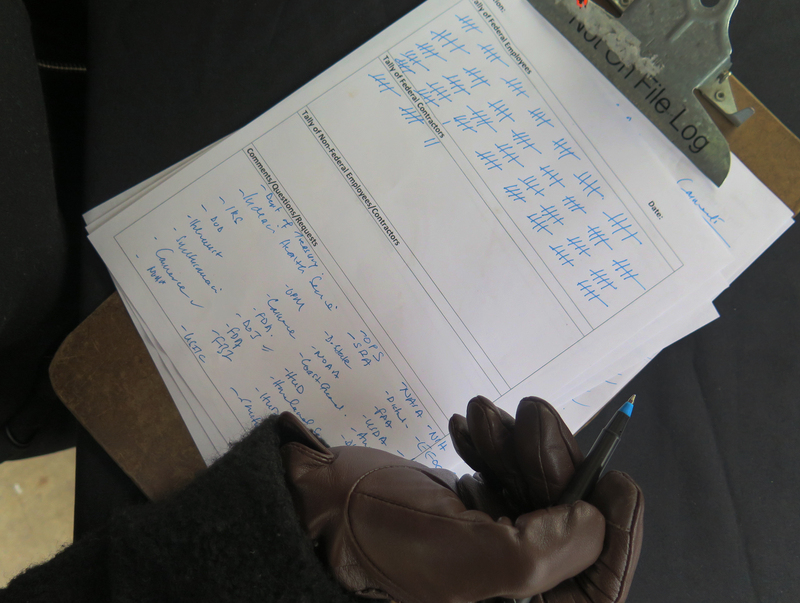 IAN STEWART, BYLINE: It was below freezing in Rockville, Md., at 9 a.m. But dozens of federal workers formed a line that stretched around the block, waiting to pick up fresh produce and canned goods - all free. UNIDENTIFIED PERSON #1: All right, everyone. We're getting ready to get started. If you could just have your federal IDs ready. STEWART: As the line moved forward, Capital Area Food Bank CEO Radha Muthiah was taking notes on what agencies they work for. RADHA MUTHIAH: Department of State, Commerce, FDA, FBI, Coast Guard - we just had a woman from the White House. The list goes on. MUTHIAH: Having that missed paycheck yesterday, they - you know, they're just worried about where to get their food. And we've had someone say, I'll pay you back after I get my paycheck, but I just need it now. UNIDENTIFIED PERSON #2: One more bag coming, so you want to just wait here. UNIDENTIFIED PERSON #3: Oh, OK.
STEWART: For the federal workers who collected more than 30,000 pounds of produce across the region this weekend, the free food meant one less bill to worry about. And it gave them a chance to vent. Lorette Legendre, a General Services Administration contractor, called Washington's handling of the shutdown ridiculous. LORETTE LEGENDRE: Something has got to happen very soon because people can't survive like this. You know, to stand out here in 30-degree weather to get food - this is America. Something's wrong here. STEWART: Terrence Graham was also picking up food. He works in IT at the State Department and says he lives paycheck to paycheck. TERRENCE GRAHAM: Playing with people's lives for the sake of whatever political idea you're behind - it's not good. STEWART: So you feel like they're playing with your life? GRAHAM: Yeah, I do. I do. You should value the worker a little bit more than that. STEWART: Brittany May has a job at the National Institutes of Health, which has stayed open during the shutdown. She says she used to be grateful for the stability and benefits that came with working in the public sector. BRITTANY MAY: Coming up, it's like, oh, you've got a federal government job. You've got a good job. It's making me wonder at this point, should we go to private? - (laughter) because I don't ever see a private company saying, oh, OK. We're going to shut down for weeks on - at end. The only place we've seen that happen is the federal government. STEWART: The food bank says it will continue to host the pop-up distributions for federal workers until the government reopens. Ian Stewart, NPR News, Rockville, Md. Transcript provided by NPR, Copyright NPR.